Ride the ponies for a 45 minute hack before heading back to enjoy a picnic. Please bring your own picnic, we will be able to provide squash but no food will be supplied. Easter Egg for every child! All bookings to be received with payment by 5pm Saturday 5th April 2019. All bookings to be received with payment by 5pm Saturday 13th April 2019. 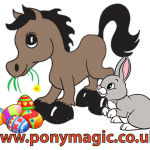 At Pony Magic we have a team of adorable Shetland ponies and our aim is to give children (MINIMUM AGE 2) a safe and gentle introduction to riding while gaining confidence and having fun. Themed parties, magical unicorns or even just a special birthday treat. Packages start at £25. Thank you for a wonderful Pony Party for my Daughter Jessica. Everyone had an amazing time. "Well worth a visit , fantastic with my daughter . Thanks for making her 6th Birthday one to remember x"